So pretty much the only clear thing is that I don’t get number 3 printed! There was voting on this blog and on ‘Did You Swim Today’ on Facebook, with different results. I think maybe two hats are called for but – while trying not to invite design by committee – I may work on them a little more. 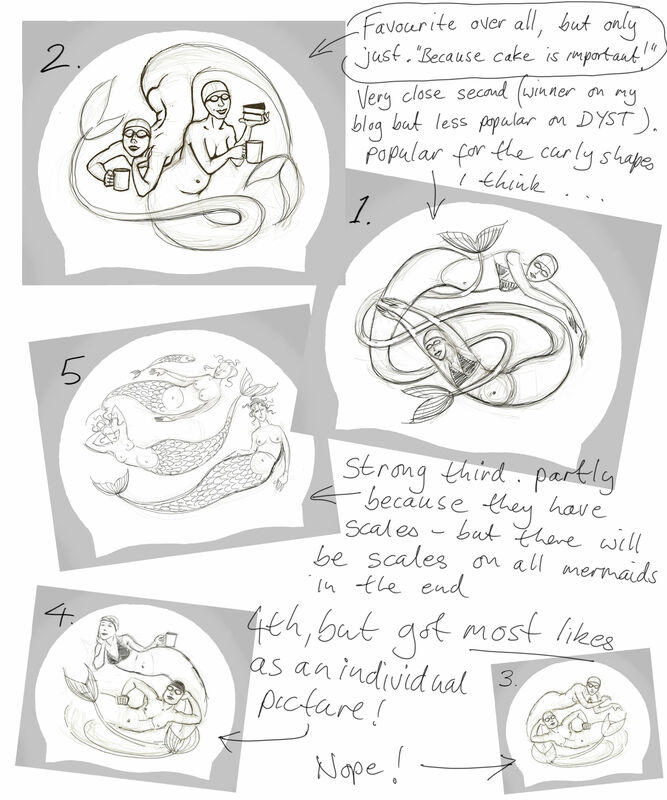 One of the popular things about number 5 was scales and I had always intended to add scales to all of them. The hair was also mentioned as a feature on number 5… not so sure about losing the hats and goggles – it’s a bit of a major change to the feeling of the other designs, and if I remove hats, then the swimming costume tops probably would have to go too. I’ll get back to you…. This entry was posted in swimming, Swimming hats etc and tagged mermaids, swimming hats on March 22, 2018 by Nancy Farmer.